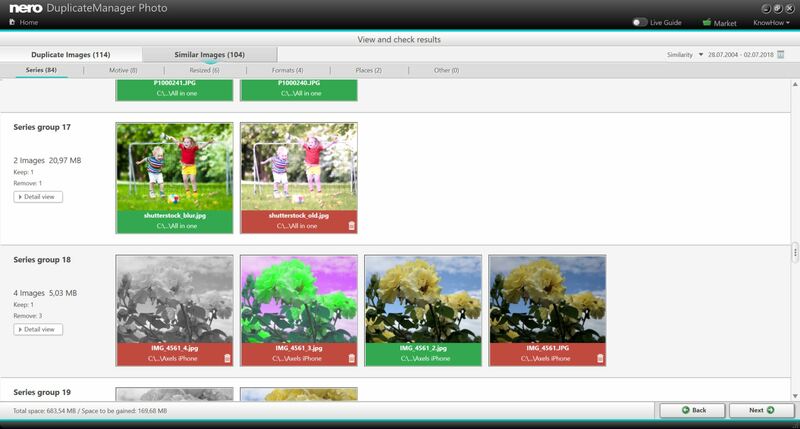 From Nero Platinum 2019 ‘Nero DuplicateManager Photo‘ comes with the new mode ‘find similar images’. Now it will find files with similar images fast and reliable. For your convenience, similar images will be automatically categorized into categories and you can select to keep or remove images based on your personal preferences. How does this work and what do the categories tell me? ‘Nero DuplicateManager’ will analyze all the photo content that you have selected for analysis in the home page via the add function. When you have added one or several folders (even a complete drive) for duplicate detection click on ‘next’. Now ‘Nero DuplicateManager’ will detect your exact duplicate images first and provides recommendations what is save to delete. The pre-selected red color at the bottom of the thumbnails indicates this. In a second step, it will identify images that have a common source but have gone through different variations on your system over time. In this ‘Similar Images’ mode Nero DuplicateManager cannot and will not give recommendations what is save to delete, as the decision must be done by yourself. The category tabs ‘Places’, ‘Series’, ‘Motives’, ‘Resized’, ‘Format’, and ‘Others’ already give a clue as to what the detected similar images relate to. When the detection for similar images is finished, ‘Nero DuplicateManager’ will list the categories in the order of the number of detected images per category displayed on the respective category tab. So, if most of your images are related to series shots, you will find the category ‘Series’ on the left hand side tab to start with. Imagine you went on vacation and you have done many shots in different locations with the geotagging function switched on in your smartphone. E.g. if you went to a museum you may have done shots within a range of maybe 0.5 kilometers over some hours. For sure, there are shots with very similar content and shots sizes, especially when your wife and kids did more or less the same shots on their smartphones in the same location. Now, when you have imported all of the assets to your PC system, you will find many images that look very similar, although they are no exact duplicates. ‘Nero DuplicateManager’ makes it easy for you only keeping your favorites. The deleting can simply be assigned by hovering over the image and selecting the red basket icon, after which the indicator at the bottom of the thumbnail turns to red color. Simply undo this via the green thumb icon, after which the bottom of the thumbnail turns to green color, indicating that you want to keep this image. Today, almost all smartphones or camera devices have an option to do HDR series shots, where images with lower, higher, and medium aperture per shot merge into one HDR image, which has more contrast and detail. If you did not deselect the option to keep the source files together with the HDR shot, you will end up with a number of almost identical images that just have different aperture values. Another case related to a fast sequence of series shots is doing bracketing shots. Just press the record button longer, and your device will create a series of almost identical shots over the time you press the button. 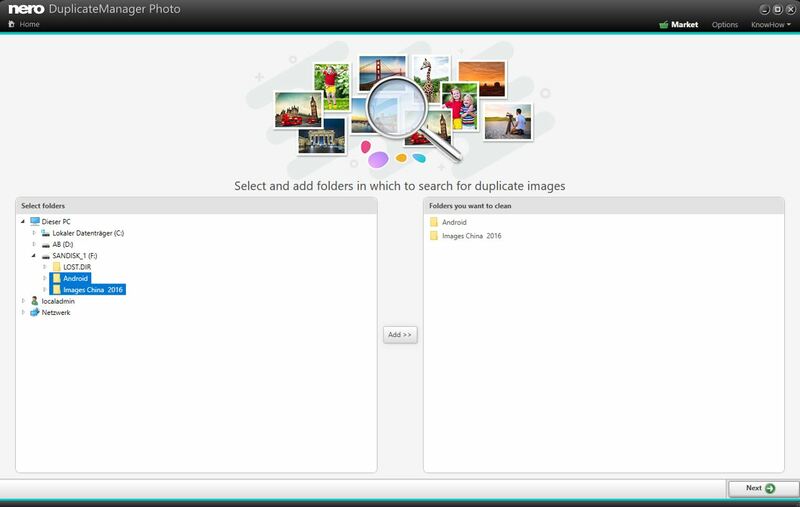 For both cases, Nero DuplicateManager will collect these images under the category ‘Series’. Just select your favorites (green) and free yourself by simply deleting (red) the rest. You might have done shots of your kids or friends in the same circumstances or location over a given time that have very similar shot sizes, and motives but do not qualify for series shots or places (no GPS data). Such images will be sorted into the ‘Motive’ category. As with the other cases, in here, you also have options for modifying similarity and time settings. I guess you also have made the experience to downscale large images occasionally, just by reducing the resolution, e.g. if you want to put them into a ‘PowerPoint’ slide deck, or share them via mail attachment / via social media. 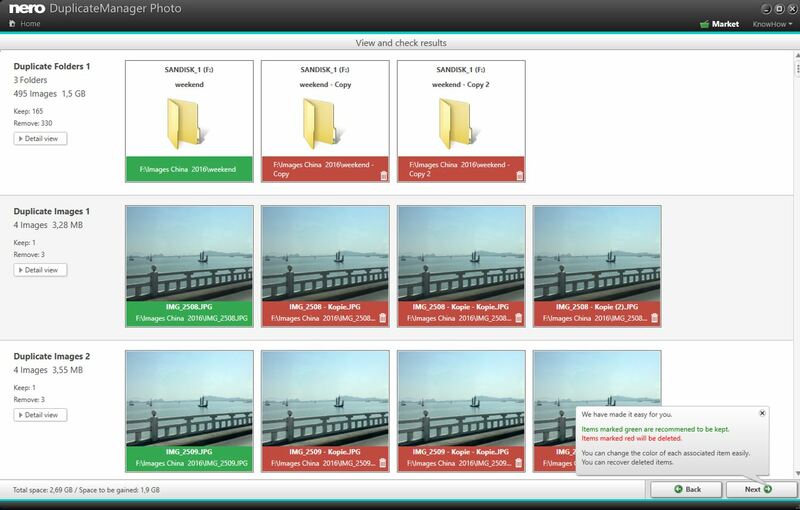 ‘Nero DuplicateManager’ detects these images and provides concrete information on the image preferences e.g. resolutions via the ‘Details’ button. Now it is easy just keeping what you like to keep when cleaning up your image archive. As a rule of thumb, we recommend always keeping the image with the highest resolution. This will be your original shot with the best quality, in most cases. As a matter of fact, images come in different formats. Imagine you have exported the same image from a photo editing project once as a PNG to make use of the alpha transparency in your video editing project, or just exported it as a JPEG for sharing. There are different reasons why you export and convert images to different formats with the same content. ‘Nero DuplicateManager’ detects different image formats with the same content in the category ‘Formats’. Just decide what you want to keep (green) or delete (red). Any detected image that does not fall into one of the above categories lists under ‘Other’. In most of the above cases, you can define the number of detected images more precisely by adding a special time (day, hour) or change the similarity slider from low to high. 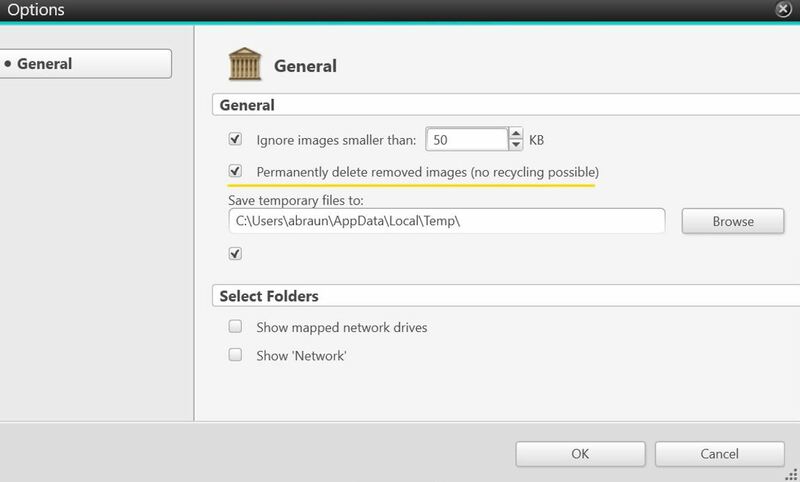 When you have selected the images, you want to keep or delete, click next and the images will be put to the recycle bin. You can restore these from within the application – so, no worries! 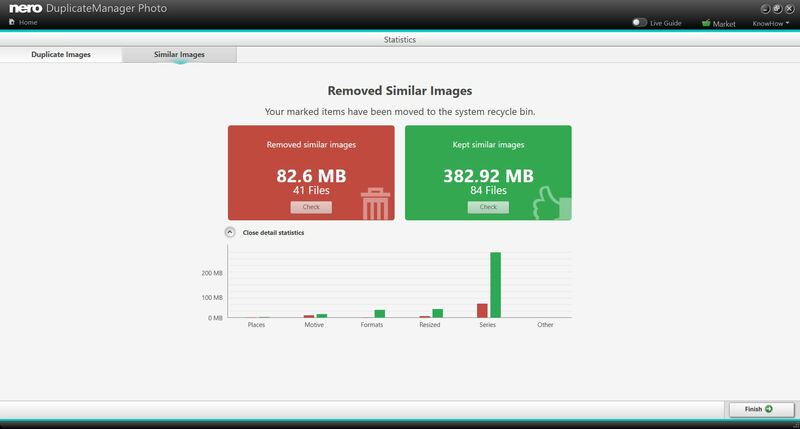 Both tabs ‘Duplicate Images’ and ‘Similar Images’ will give an overview of what was deleted or kept. The similar images tab also has a detailed statistics view visualizing the categories. This is very helpful for checking what you deleted and kept, and where you might want to come back to at a later point. Can I find and remove similar images with Nero DuplicateManager? Got lost with all the duplicated and similar photos in your PC photo archive due to photo editing and HDR image import from your smartphone? 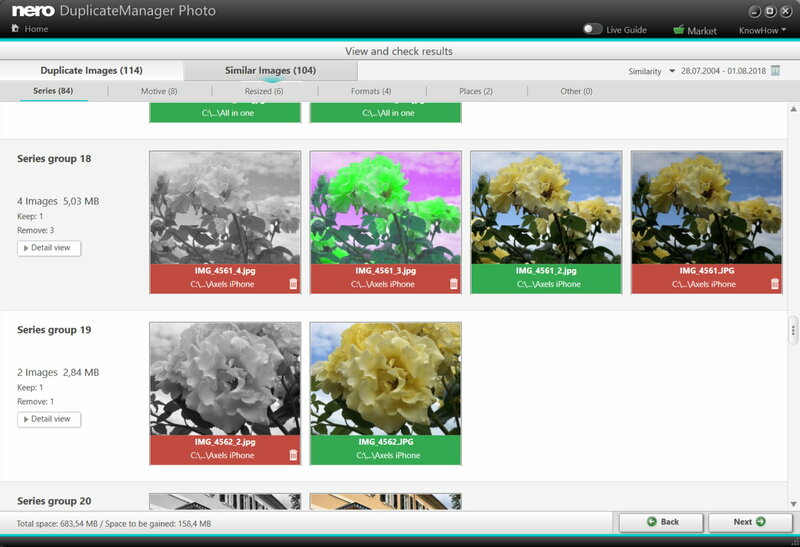 From Nero Platinum 2019 ‚Nero DuplicateManager Photo‘ comes with the new mode ‘Find similar images’. Now it will find folders and files with similar images fast and reliable. For your convenience, similar images will be automatically categorized into places, series, motives, resized, format, and others and you can remove images based on your personal preferences. How can I safely clean my image archive and remove duplicate images? Our users are frequently asking this question. From version 2018, Nero Platinum has an answer to such questions. The brand new application ’Nero DuplicateManger Photo‘ addresses and solves issues with duplicated images fast and easily. How does a big amount of duplicated photos heap up on your PC? Anyone using his PC to archive his photo collection from smartphones, digital cameras, USB sticks, online storage, and the like, will have experienced the problem, probably more than once. Let us take an example. Imagine you are enjoying a trip with family and friends. For sure, anyone of the group will take the chance of shooting photos and you will see quite a range of different devices. The trip is ending and everybody has shot nice images that he wants to exchange with everyone in the group. Back home you might transfer your own images to your PC right away, and in order to initiate the photo sharing, you use an online storage for sending a link to your travel mates. And indeed, step by step the other images are being shared. But not everybody likes sharing online. One guy is sending the images on a DVD, another one makes use of a USB stick sent via post mail, and you also receive some images as email attachments. By the nature of this sharing situation, nobody can take a central control over the images shared via the different media and channels. So, most probably, it will happen that you are going to copy anything, and end up with many duplicates. Initially, you may not even realize this, but over time, you will be irritated to see that your media library contains so many duplicates and the storage space on your PC is shrinking dramatically. Even if the circumstances might be different in your situation, the problem of duplicates heaping up will be the same. And, there is a second problem. Which images should I keep? Which should I delete? Due to the fear of deleting unrecoverable memories, there is a strong tendency not to answer this question at all and just leave the status quo. This of course will let you circle around the problem in endless loops. How does Nero DuplicateManager work? On Nero DuplicateManager start page select your drives and folders like you do it in Windows Explorer. For multi-selection of several folders/drives use the control key. Clicking ‘add’ enables you to add single or several folders, single drives, and also the whole system (‘This PC’) for detection and cleaning. Click next and the detection will be performed. This works quite fast but of course is depending on the amount of data on your selected storage location. The next screen already shows results for duplicated folders in the upper part. Single duplicated photos are shown below per line. You will find green marked folders and images indicating that these are good to keep while the red indicated folders and images are set to be removed. For each proposal Nero DuplicateManager makes use of diverse criteria consisting of meta data and content detection data. 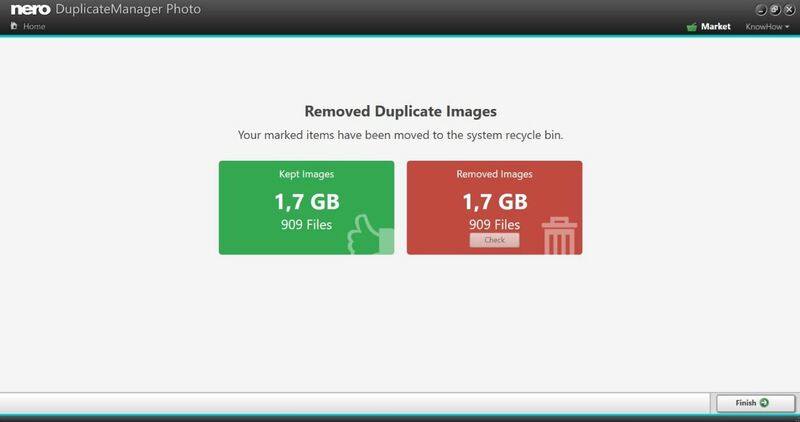 The detection is very solid and you should have no problem taking over Nero DuplicateManager’s default proposal for removing your duplicated photos. If you like to check the detection of duplicates, double click on a folder thumbnail or just click on ‘Detail view’ on the left hand side. If you move the mouse over folders or images, a green or red icon will appear. If you click on the respective icon a green indication will turn red, and a red indication will become green. If you select the latter, e.g. you will mark this folder or image as not to be removed. This way you have full control on what you want to have removed or want to keep. Clicking next will remove the red marked folders and images, and put them to the recycle bin. After the removal is done you will see the status page showing you the amount of removed data in the red box on the right hand side. If you want to check what was deleted click on ’Check‘. Via selection and right mouse click, you have the choice of finally deleting the images from the recycle bin or for restoring them. If you decide not to permanently delete the images, you will have clean folders in Windows Explorer and in your media library, but the files will remain in your recycle bin eating up storage space. Once you have used Nero DuplicateManager a number of times you will probably be convinced of the solidity of its cleaning results. This would be the point when you should go to ‘Options’ and select ’Permanently remove deleted images’. Next time you do a cleaning, this will automatically also clean the recycle bin, resulting in gaining more storage space right away.